Afrin has welcomed many Internally Displaced Persons from other regions of the country which has led to a doubling of its population to 400,000 and 500,000, because it was relatively spared from the war and aggression of the Assad’s regime forces. 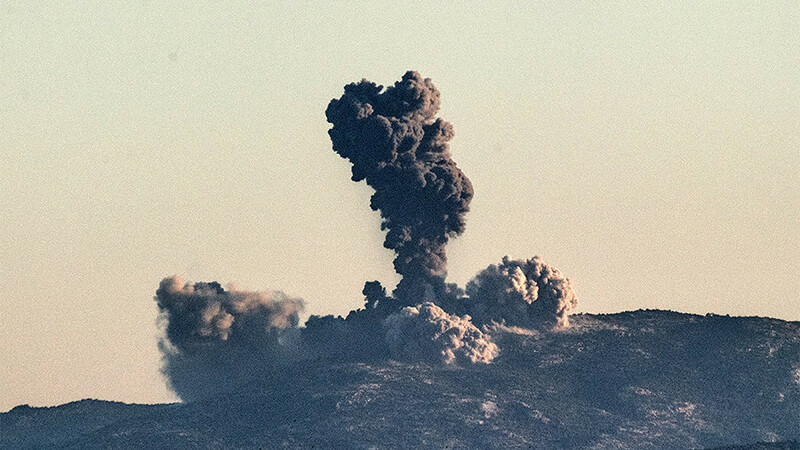 This attack comes after months of tensions and aggression by the Turkish military against Afrin. The Turkish army used as a pretext, an announcement by a military spokesman for the US-led global coalition against the Islamic State (IS) to build a 30,000-strong border force under the command of Syrian Democratic Forces (SDF) led by People’s Protection Units (YPG). In Ankara’s opinion, the US decision meant that the US-YPG partnership would not end with the collapse of the IS, as the Turkish government had hoped. Turkish President Recep Tayyip Erdogan said the Afrin operation would be followed by another against Manbij. Erdogan also threatened any critical voices in Turkey against the "Operation Olive Branch", notably stating in reference to pro-Kurdish Peoples’ Democratic Party (HDP), "that wherever you go out on the streets our security forces are on your necks". With the exception of the HDP, the rest of the main parties in Turkey, including the fascistic National Movement Party (known as MHP) and the Kemalist Republican People’s Party (known as CHP), support Turkey’s military intervention. Despite a statement from the Russian Foreign Ministry expressing “concern” and calling on the parties "to show mutual restraint", Moscow, which controls large large parts of Syrian air space, has actually given Turkey the green light for this invasion and has withdrawn its forces from the areas targeted by Turkish forces. Russian officials had demanded that the YPG hand over Afrin to the Syrian regime to "stop" the Turkish attacks on the region. The USA has remained rather passive, only urging Turkey to exercise restraint and ensure that its military operations remain limited in scope and duration. At the same time, Russian, Iranian and Turkish diplomats met to prepare for the Syrian "National Dialogue Congress" to be held in Sochi, Russia on January 30, and seek to consolidate a so-called peace process in which the Assad regime’s structures would be maintained. The Syrian National Coalition Of Syrian Revolution and Opposition Forces (known as the Etilaf), composed mostly of liberal and Islamic conservative and fundamentalist groups and personalities, have not only supported the Turkish military intervention and continued their previous chauvinist policies against the Kurds in Syria, but are also participating in this operation by calling on Syrian refugees in Turkey to join the Syrian armed opposition groups fighting in Afrin. At the same time, we condemn the Assad regime’s attacks on Eastern Ghouta and Idlib, areas which are supposedly considered “de-escalation zones” according to the Astana "peace" negotiations, led by Russia, Iran and Turkey. There has been a consensus between all the international and regional powers on the necessity to liquidate the revolutionary popular movements initiated in Syria in March of 2011 and to stabilize the murderous and authoritarian regime in Damascus with Bashar al-Assad at its head in the name of the "war on terror". It is this consensus which has given the latest carte blanche for these crimes.